Lieutenant JG Saavik is a fictional character in the Star Trek universe. She first appeared in the film Star Trek II: The Wrath of Khan (1982) played by Kirstie Alley. Robin Curtis took on the role for the sequel, Star Trek III: The Search for Spock (1984), and in the next film, Star Trek IV: The Voyage Home (1986). A few sources have her (non-canon) origin story aligned to original material found in the film's novelization, as follows: she was rescued from the colony, along with other children, by Spock, and she was cared for by his parents Ambassador Sarek and Amanda Grayson. Following in the footsteps of her mentor, Spock, she entered Starfleet Academy. In the non-canon 1990 novel The Pandora Principle, written by Carolyn Clowes, it is established that four Vulcan research ships were captured by Romulans. Their Vulcan crews were abducted by Romulan scientists and their fertility was manipulated to produce half-Romulan, half-Vulcan children such as Saavik to use in mind control experiments. Vulcan scientists learned of the experiments and mounted a secret rescue of Saavik and other child survivors on Hellguard. Spock threatened to reveal the story to Federation authorities and along with it the secret of the Vulcan mating cycle pon farr if the survivors were denied Vulcan citizenship. Other members of the party wanted to educate them elsewhere and send the children to live on worlds other than Vulcan. Clowes writes that Saavik's name is of Romulan origin and translates as "little cat". In The Pandora Principle, Saavik, unlike the other half-Vulcan, half-Romulan child survivors, refuses a DNA test that would identify her Vulcan relatives. Instead, Spock, who has established a bond with her, takes a year of personal leave to "civilize" and educate the 9- or 10-year-old Saavik. She then lives off Vulcan with foster families or at boarding schools chosen by Spock until she is accepted into the Starfleet Academy as a teenager. This agrees with the Star Trek III: The Search for Spock novelization which said Saavik has never been to Vulcan until then. After graduating, as a fresh Lieutenant Saavik was on her cadet cruise on the USS Enterprise with Admiral James T. Kirk and Captain Spock when Kirk's old enemy Khan Noonien Singh sought revenge for the failure of the Ceti Alpha V colony and the death of his wife, Marla McGivers, and attacked the Enterprise. The role of Saavik in Star Trek III went to Robin Curtis when Alley declined to return for less money for a larger role than she received in Star Trek II. The character of Saavik was originally intended to appear in Star Trek VI: The Undiscovered Country, which would have revealed her as a traitor to the Federation. The idea of using an established character was dropped and a new character, Valeris, was created instead. According to director Nicholas Meyer, writing in his autobiography, The View from the Bridge, Saavik was dropped from the film and Valeris created when Kirstie Alley proved unwilling to reprise the role, while Leonard Nimoy, in his autobiography I Am Spock, said there were also second thoughts about casting a popular, established character as a villain. In the novel Vulcan's Heart, which takes place some years after Undiscovered Country, an older Saavik marries Spock. Saavik appears again in the Vulcan's Soul trilogy of novels published from 2004. In this continuity, the character has risen to the rank of Captain. In the Titan novel, Taking Wing, it is clearly stated that Spock and Saavik are married, as she sends greetings through Tuvok. Star Trek books are not considered part of the established canon. In the "Mirror Universe Saga" trilogy of novels written by William Shatner, it is revealed that the Mirror Universe's Intendant Spock had a daughter named T'Val with Mirror Saavik. 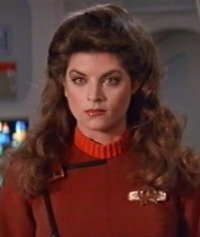 Kirstie Alley did play Saavik one other time, in a play that was set between The Wrath of Khan and The Search for Spock, "The Machiavellian Principle" written by Walter Koenig for the ambitious "Ultimate Fantasy" convention. It also starred DeForest Kelley, James Doohan, Mark Lenard (not as Sarek), Walter Koenig, Nichelle Nichols and George Takei, with a walk-on role by William Shatner as "the Admiral". The short script was eventually published by Creation Conventions in a booklet about Koenig's career, called "Through the Looking Glass". It misspells the name in the cast list as "Savik". Samuel A. Peeples' unused script, Worlds That Never Were, for the second Star Trek film, had a male character called "Doctor Savik", who eventually was morphed into the female Lieutenant Saavik. ^ McIntyre, Vonda N. (1982). Star Trek II: The Wrath of Khan, Pocket Books. ^ Clowes, Carolyn (1990). Star Trek: The Pandora Principle, Pocket Books. ^ McIntyre, Vonda N. (1984). Star Trek III: The Search for Spock, Pocket Books. ^ Nemecek, Larry (2003). Star Trek: The Next Generation Companion. Pocket Books. ISBN 0-7434-5798-6. ^ Meyer, Nicholas (2009), The View from the Bridge: Memories of Star Trek and a Life in Hollywood, Plume, pp. 203 & 212. ^ Nimoy, Leonard (1995), I Am Spock, Hyperion, p. 319. ^ Sherman, Josepha & Shwartz, Susan (1999). Star Trek: Vulcan's Heart, Pocket Books. ^ Sherman, Josepha & Shwartz, Susan (2004). Star Trek: Vulcan's Soul: Exodus, Pocket Books. ^ Martin, Michael A. & Mangels, Andy (2005). Star Trek: Titan: Taking Wing, Pocket Books. ^ Shatner, William with Reeves-Stevens, Judith & Reeves-Stevens, Garfield (1998). Star Trek: Spectre, Pocket Books. ^ Koenig, Walter (1987), Through the Looking Glass, Creation Conventions. ^ Peeples, Samuel A., Worlds That Never Were unused script. This page was last edited on 23 March 2019, at 02:14 (UTC).